SKU: 70117. Category: 1940s, Clothing, Cocktail Dresses, Decades. Tags: 1940s dress, vintage 1940s, vintage cocktail dress. 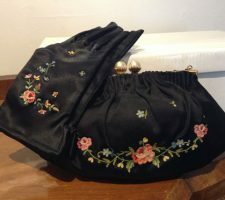 A beautiful 1940s black velvet dress with applique detail. This vintage 1940s cocktail dress is so elegant and unique! Glamour, elegance, romance and style. What more could a girl want? 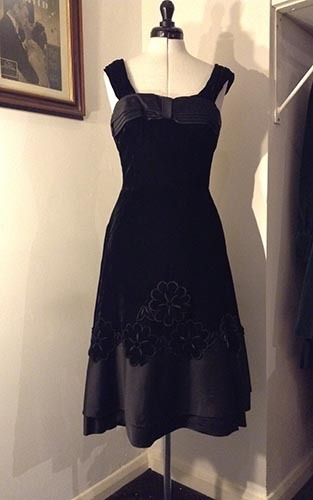 In silk velvet, this 1940s dress has stunning applique detail on the hem. If you hold your mouse over the photos you should be able to see this work in close detail. I’m not sure if the camera has picked up the small, gathered detail on the silk velvet shoulder straps which are angled to enhance the flattering neckline. Approx size: measured flat – Bust 33″; Waist 27″; Hips 40″ Similar to today’s UK size 8, I believe. 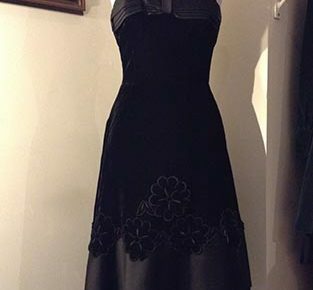 Definitely worth making a trip to Winchester to fit this gorgeous 1940s black velvet dress. Condition report: The bodice area is missing one support. The dress also has two diagonally placed light supports in the back. The stitching which attaches the trim to the bustline is, I believe, intended to be loose (to avoid fabric tension) but you might want to tighten the stitches on one side depending on your fit. Originally, there were some marks on the satin areas of the double hem but these have been successfully removed when she was at the cleaner.